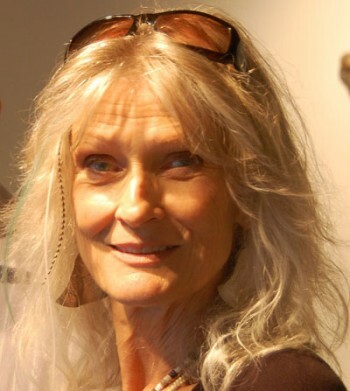 10:45am | Dorte Christjansen has, for decades, been renowned for developing innovative techniques for batik, a wax resist process used on cloth. Her watercolor and batik creations explode with vivid hues, often showcasing the natural beauty she finds in her garden. This Friday, her work will be on display at Free Spirit Yoga on Atlantic Avenue, part of the monthly Bixby Knolls First Fridays Art Walk. This weekend, she’ll be one of nearly 30 professional artists to open their homes to the community as part of the biennial self-guided Long Beach Open Studio Tour, taking place throughout the city on Saturday and Sunday. I asked her what she discovered when she went on the tour in 2009. Dorte: That studios are as individual as the artists who work in them. I did get some ideas about how I would like to arrange my studio for the tour without altering its working aspect too much, since it’s interesting to see an artist’s work environment/space. It was also interesting to see the diversity of styles and techniques that artists have developed to express themselves. Sander: Tell me about your work. Dorte: My work evolves from observations from nature, both wild and cultivated. Landscape, plants, gardens. I tend to grow plants in my garden that interest me, and make many studies of them which then become watercolors or batiks. I am particularly interested in pattern and have been working on a series inspired by kaleidoscopes or mandalas. The batiks are created with dyes and wax on silk combined with gold leaf. These can be seen on DorteChristjansen.com. I also like to work with themes–specific relationships in nature and cycles that illustrate or tell a story. Sander: What are some of the themes, or stories, you’ve discovered? Dorte: I’m working on a batik that shows the cycle of Monarch Butterflies. Since I planted milkweed in my garden they have been visiting, depositing eggs, and going through the various stages until they emerge as butterflies. It’s a beautiful and fascinating process, and inspired a series of studies in both watercolor and now batik. I’ve recently completed a batik that featured only night blooming plants such as cacti, night blooming cerius and brugmansia, amazing blooms rarely seen (except the brugmansia) because of the timing and brevity of bloom. Sander: That’s rather like the ephemeral quality of all life, isn’t it? Dorte: I like that! That’s one of the responses I hope to inspire in the viewer, that he/she will intuit or find their own visions and metaphors in the work. Part of my fascination with nature is that it is temporal, and I want to try to capture the moment. Sander: That’s one of the interesting aspects of working in mandala forms. You can use representational images but, in arranging them, create an abstraction. Dorte: You’re right. You can look at it for the microcosm or the macrocosm. There are so many shapes, rhythms, and movements that shift from one level to another depending upon how and where one focuses. I like layers of complexity. Sander: What shapes the choice of batik or water color for a particular piece? Dorte: I often do watercolor studies that then are developed into batiks. Batiks allow for a different mode of expression for me. It’s hard to explain, but I feel it is a different language, one that frees me to do a different type of image. It brings an intuitive response that feels right. Watercolor has similar properties in the way the medium flows, but it seems to result in more conventional imagery for me. Part of what I love about batik is that it is a reverse way of working. To sum up, a practical reason for choosing one over another is that an image with a lot of dark detail on light ground calls for watercolor while one with light details on a dark ground calls for batik. Batik has a long, varied history, depending on location. I find Indonesia, Japan, India, have all been influential for me. When I stared to learn about it I became very inspired by its possibilities and strangely possessive and competitive about it! Sander: How does batik become competitive? Dorte: At one time, batik was considered to be an “artsy craftsy” medium that hippies used to dye t-shirts and scarves, so I wanted to prove that it was a legitimate art form (as seen in historical batiks). This drove me to try various processes, techniques and images that would be challenging, both for me and the viewer. I also was driven to do better all the time, especially when I saw other contemporary batiks. You know, “I can do better than that!” Sounds kind of pompous, doesn’t it? Still, I have presented many workshops to teach my techniques to others, and try to instill and share the love and respect I have for the medium, as well as my process. I was included in a book about silk painting, a contemporary moniker, which was a great reinforcement for me to the place of batik in contemporary art and style. Learn more about Dorte and her work at DorteChristjansen.com.